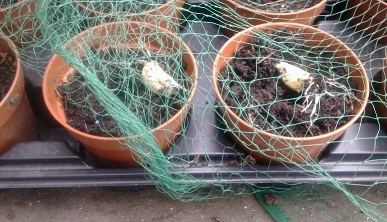 Thanks to the very kind Angela I have cayenne seeds a-plenty and a few are now in some warm compost doing their thing. This weekend just gone was pretty hopeless for all things plot-related. It rained for 2 days so I have an informal pond again, and that sapped my enthusiasm for getting on with cutting blackthorn. I’ve moved 3 blackcurrants from Mum’s to the plot in their pots, and shifted a carload of bagged topsoil that will bump up the levels in what will be the soft fruit bed. Jackdaws found my garlic pots on the balcony, but I stuck the cloves back in and rebuilt the bird defences and hopefully that will do for now. And today my Greenfingers delivery arrived – a garden arch, a triple-bag compost bin for my barrows of manure to rot down in, and a culti-cave, which I am determined will not blow away into the cemetery…! Am very much looking forward to the Edible Garden Show on Saturday and meeting up with a few people from the Forum.